The Fairfax is Northern Virginia’s premier senior living community for retired military officers and their spouses (US Uniformed Services, CIA, FBI, Foreign Service, and other Federal Agencies, in addition to parents of active and retired military personnel). Established in 1989 by the nonprofit Army Retirement Residence Foundation-Potomac (ARRF-P), our residents take pride in our rich history steeped in military traditions, and we are also honored to offer an opportunity for non-military residents to call The Fairfax home. Because most of our residents have the shared connection of serving in our military or government, our activities calendar is tailored to their common interests. We emphasize our annual events as an opportunity to gather and celebrate the incredible men and women who live among us and have served our country by arranging celebrations on Independence Day, Veteran’s Day, Memorial Day, service birthdays, and other meaningful occasions. In addition to frequent trips in the local Northern Virginia and Washington D.C. area, we host overnight trips to Cape May, resorts in Pennsylvania, and many other historical locations up and down the East Coast. And, to ensure the community is consistently meeting residents' needs, we are proud to boast an active Residents' Council with elected representatives; each building has two Council representatives, and these individuals pay close attention to their neighbors' feedback and opinions, to constantly refine the resident experience at The Fairfax. Each day, we host a variety of activities, including yoga classes, bridge games, lectures, current events discussions, musical performances, and writing and poetry groups. We take pride in our culinary excellence, and frequently feature theme nights, as well as pop-up farm-to-table dinners in the courtyard. With both formal and casual dining, as well as private dining options, there is something for everyone at The Fairfax. We would love to talk with you and your family about what life is like at The Fairfax. We invite you to give us a call, schedule a tour, and talk with us about enjoying the next chapter of life among new friends and beautiful surroundings. Learn more about The Fairfax's beginnings in Fort Belvoir and continued partnership with the Army Retirement Residence Foundation-Potomac. Our community and residents were recently featured in an article in the At Ease: Mid-Atlantic Milirary Life Publication. Read more here. For a limited-time only, The Fairfax is offering 15% off your entry fee and up to $500 off your monthly fee if you move in to our Madison Building today! Save up to $800/month for couples and $500/month for single entries. Call us today to learn more about this special offer today! *This limited-time offer is subject to availability and resident meeting admission requirements. Other restrictions may apply. Must sign residency agreement by April 30, 2019. 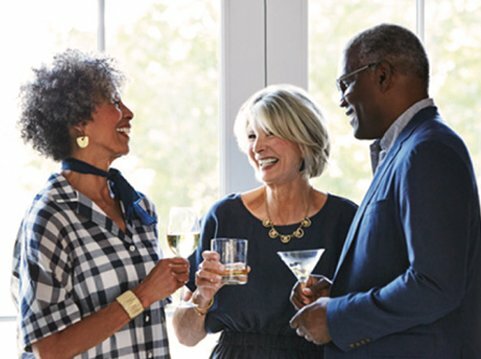 Wednesday, April 24 | 2:00-4:00 p.m.
Join The Fairfax and TAD Relocation to learn more about The Fairfax's 'Try Us Out' program, a 30-day, fully furnished stay at The Fairfax, and how to downsize in order to move into a retirement living community. The move to an independent living community can be complex, from making the initial decision to selling your current home. That’s why The Fairfax has created the Try Us Out program. Experience all of the benefits of maintenance-free living on our gorgeous 60-acre campus, along with our full range of activities and amenities — all while avoiding the hassle of living in your home while it’s on the market. Please RSVP to Amanda Earle at 703-781-2410. Saturday, May 4 | 10:00 a.m.-1:00 p.m.
Have sensitive documents that need to be discarded? If so, we invite you to join The Fairfax team and the Army Retirement Residence Foundation-Potomac for our Annual Shred Event! Located at the Community Center Circle. Please RSVP to Diana at the Army Foundation at 703-781-2460.